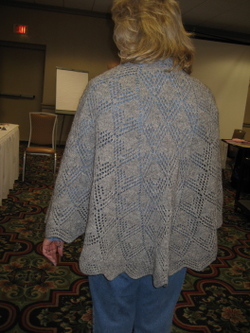 The Faroese-Style Lace Shawl class with Myrna Stahman was very good. Myrna presented a history of the shawls, reference works, and how she started to develop her patterns which are Faroese-style but worked from the top down. 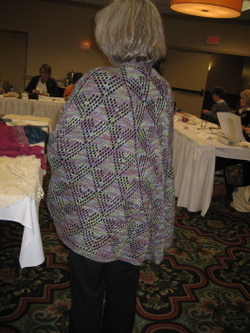 As a class we worked through a few practice activities so we would be familiar with techniques used with this shawl in the morning. 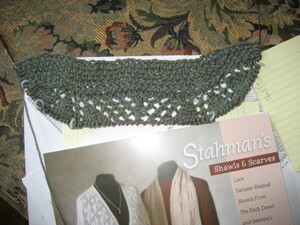 After our lunch break, we started the pattern for the shawl. Here are two versions of the pattern we are knitting. I'm modeling the left shawl which has a lace edging and is knit in a yarn that is probably a DK-weight, if I remember correctly. The shawl on the right, modeled by one of my classmates, has the seed stitch border and was knit with STR in the original sock-weight yarn. The shawl really does sit comfortably on my shoulders, just like the design is supposed to do. I'm knitting my shawl in Cascade 220 because I wanted a heavier shawl to wear in place of a coat or in a chilly winter house. I have knit a few more rows but I'm just too tired lazy to take another photo. You'll be seeing this again. I think I finally have a rhythm going with this pattern. Now, I need to achieve a similar rhythm with Forest Canopy! Yes, I also picked up my rigid heddle loom but I didn't put it together today. I'll (probably) be home during the evenings later on this week so I'll have time for it soon.